Wearing some of the wonderful pieces I got for Christmas, but as always sticking with the simple outfit formulas I love. Some frill sleeve statement tees, printed shorts and my new Rebecca Minkoff MAB camera bag that I got for Christmas. As well as the new tee and bag, these shorts were a new purchase. I tried to resist the January sales, but the Kmart clearance was too tempting and I scored these $15 shorts for $5. Since my other pair of blue printed shorts reached 30 wears, I knew these would become a firm favourite in my wardrobe. The print I thought was wattle but the tag says lemon. I decided to pair this bright pink tee with them due to the pastel pink in the print. With all of the colour and the printed colourful headband as well I added the neutral gold sandals and almond Rebecca Minkoff camera bag to balance it all out. 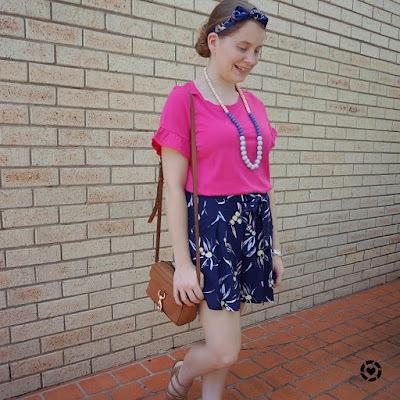 I wasn't too sure if the headband was too much with this outfit, given the bright colours, statement sleeves and tie on the shorts, but I think it worked nicely together in the end, and helped disguise a bad hair day a little bit! The shorts were perfect for a first wear, and a practical choice for running around with the boys at a playground in the morning. Last worn: navy headscarf, rose gold sandals. First time I've worn the pink tee, blue necklace and camera bag as they are Christmas gifts, and first time I've worn the shorts as they are a recent purchase. Other ways to wear: navy headscarf on a bag, rose gold sandals and maxi dress. Since I liked the first outfit so much, I repeated the same outfit formula again later for a busy day. Park with the boys in the morning, seeing hubby off to the airport on a work trip, then dinner and watching Church Online at my friend's house in the evening. It was a hot and humid day, so shorts and a tee seemed like a good option. We didn't stay at the park for too long before heading back to the aircon! First time I wore this navy statement sleeve tee I paired it with the pastel pink tassel necklace. I really liked the combination, so wanted to try it again. The tassel also worked nicely with the tassel tie on the printed shorts. Navy and black is a combination I've worn together a few times before - I used to be unsure of it until I bought a dress years ago (before the blog) that featured both colours, and figured if it was good enough for the dress is was good enough for me to try with separates! The neutrals work nicely together. 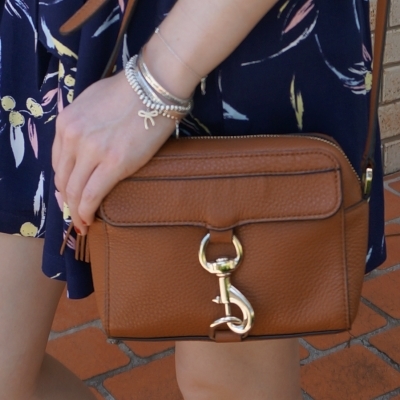 Added in another neutral accessory to the combination with the almond Rebecca Minkoff MAB camera bag. 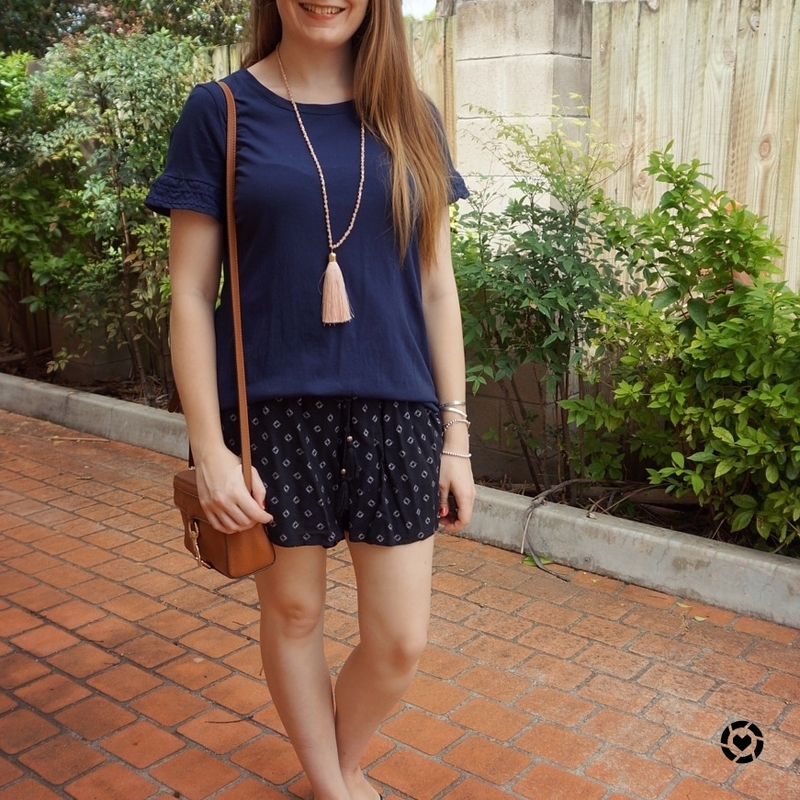 Last worn: navy frill sleeve tee, pink tassel necklace, black printed shorts, Havaianas, MAB camera bag (above). Other ways to wear: navy frill sleeve tee and pink shorts, pink tassel necklace and matching shorts, black printed shorts with stripes. Shorts and tee is a summer staple! It's easy to add a little more interest to your outfit with a fun pair of printed shorts, but why not go for an extra detail on your tee too? These frill sleeve tees let you take part in the statement sleeve trend without getting in the way and getting caught in doors or dirty as you make food and snacks for the kids! Really mum friendly. Linking up with Thursday Moda, Fancy Friday, Fabulous Friday, Weekend Wear, Trendy Thursday, Weekend Linkup. Blue and pink are so great together, I love the bright pink tee and Mica - what a deal on your shorts! You seriously have the best collection of bags! I'm so jealous, you have such a great bag collection! Such cute, summery outfits! I love both pairs of your comfy printed shorts! Love this kind of pink, so pretty and sweet. This bag looks like Chloe very classic. I'm still waiting for the rain to come for my plants. Happy almost weekend! Loving the print of your new shorts, so cute!! It's always so fun wearing new pieces, you get to feel all fresh and exciting, haha! hehe yes! it's a fun feeling! These are the kinds of shorts that I love...they almost look like a skirt and are easy to move in. The fringe necklace is so pretty Mica!! They are such fun shorts! Another well-working outfit formula I see! The printed shorts with the sleeve tees work really well together and I definitely love both of your looks. How good you bought the shorts of your first look, they are really beautiful. Those shorts are such a bargain too! Yes, our Target is completely different from yours too! That camera bag is so cool! I really like shape and color! I really love that blouse on you in the first look! The color is gorgeous. I completely adore your hot pink and blue outfit, Mica! You are like a tropical flower! Your hair looks lovely in the scarf/headband. Happy week to you, my dear! Thanks Sheila! It was so fun for such a hot day! Yes soft shorts are so good for summer! A shorts and tee combination really is a classic. I love the fun extra detail the frills on the sleeves provide. It's such a nice touch. I adore your picks as always! The pink top is super cute and it really looks good on you - a burst of colour is all we all need in our lives. Cute outfits and another great bag. I like the great bid buckle on it. Firstly, I am so jealous you have tee shirt weather :) Blue and pink is such a beautiful color combo and I am glad you went with the head band. Your accessories are on point. Enjoy the rest of your week beautiful lady. What an awesome find on the printed short. Love how you paired them with the fun bright top. I love both of these looks. Its great that those shorts give you so much wear Mica. They look super comfy. As always love the bag! How fun is that little camera bag?? I love both of these looks too. The color of that tee in your first look is gorgeous and I love the scarf in your hair. I love that tassel necklace in your second look too. So much cuteness:) I especially love those cute shorts from K-mart...I am ANXIOUSLY awaiting summer here! That skirt is gorgeous! I love the print and the frills, so pretty, Mica! Thanks! It's actually culotte shorts! how cute is that mini almond bag! I really like its design, so chic and unique. Both outfits you paired with this bag are very pretty. 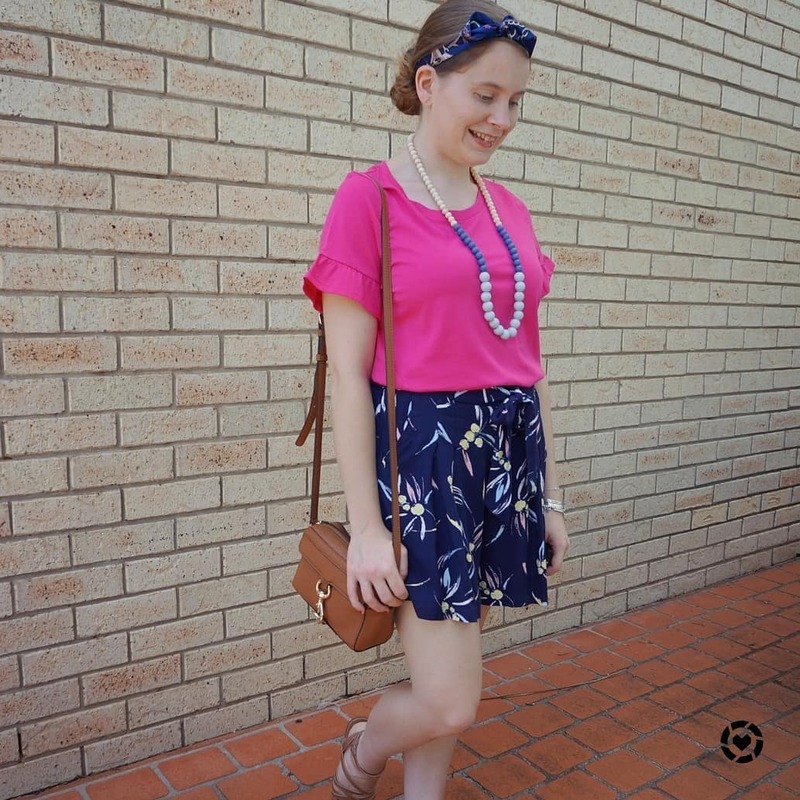 Printed shorts are always a good pairing with cute tops, and those frilled sleeves are lovely. A detail like that is always nice. You look lovely dear! Those shorts in the first outfit were a great purchase and such a deal! I absolutely love them with the bright pink top! It's such a beautiful outfit for a warm day! I love your shorts! They're great to wear during the heat and big plus that it's a bit loose. I am kind of over tight shorts. I love your second outfit. The colors go well together. Navy clothes are easy to pair. Thanks for sharing!! Love the beaded necklace! Have a lovely Day. Your shorts are so cute and yes, very practical for a mom with young kids. Your accessories work well with this look too. Love me a great neutral bag. I love both your swingy pairs of shorts, those are always a favorite to wear, comfort of shorts but the look of a skirt! That little bag is great! I hadn't seen one in that style yet and I love it! And your shorts are both wonderful finds - they look great on you and I love the T-shirts you chose to pair them with! It's such a great go with anything style! I love all the fun colors in the first outfit! The headband is a really cute accessory and goes great with the look. And both pairs of shorts look perfect for the warm summer weather! I was going to say, I didn't remember seeing that MAB camera bag before! It's GORGEOUS! And a great color too! Ugh, I'm so jealous to see you in shorts. It's so cold here! I woke up to -18 degree Fahrenheit temperatures this morning. You look adorable! I can't imagine that kind of cold! That skirt! Oh, I just realized they are shorts. Hehe. Such a pretty floral pattern.